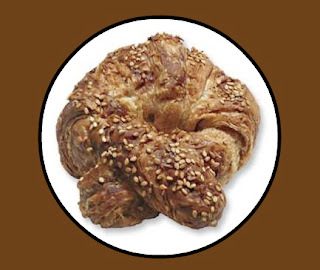 Maybe because its Passover and I have bread on my mind (well flat, rather tasteless sheets of water and flour really) that I’ve been craving another of City Bakery’s Pretzel Croissant. I usually get them at City Bakery’s 1st Avenue outpost the Green Bakery . The last one I had, right before Passover started, was just out of the oven. Pretzel Croissants are a salty version of the classic French puff-pastry. The City Bakery one is topped with sesame seeds. Add a cup of their organic coffee and its tough combo to beat. Last night I went to Gramercy Tavern with my good friend from California. He recently started collecting some Bordeaux wines and wanted to taste one with dinner. We thought about buying one a local wine store and paying a corkage fee at the restaurant. While this might sound like a good idea, last minute execution was not that easy. A quick stop at Union Square Wines, where they have “annual” 25% off sales every week”, revealed that their “cold room” was hovering around 70 degrees (actually 69. something according to the thermometer) , a bit too warm for the 10 or so bottles of 1ere Cru Classe wines. 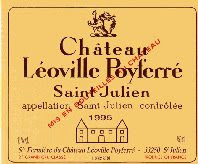 My friend instead opted to buy a bottle at the restaurant and after a thorough check of the 23 page wine list, decided on a 1996 Château Léoville-Poyferré, Deuxième Cru, 1996, Saint-Julien- (58 % Cabernet Sauvignon, 31 % Merlot, 09 % Petit Verdot, 02 % Cabernet Franc) It was fantastic! It was rich and luscious with a deep, purple-red color (like black currant). You could taste the terroir and if you closed your eyes, you could easily imagine yourself on the left bank of the Medoc. I think we finished it before the before our first course. I ordered a glass of the Barbaresco, Produttori del Barbaresco, Piedmont to have with my meal. Oh yeah, the dinner....I had handmade pappardelle with beef ragù and scallions (obviously Executive Chef Michael Anthony reads this blog), followed by grouper with sweet onions and trumpet royale mushrooms. For desert, I had a selection of 3 farmstead cheeses which were matched perfectly with the Barbaresco. Finally, we each had a glass of Tokaji Aszú, Chateau Pajzos, 5 Puttonyos, 1993- the great sweet wine from Hungary.